running into problems resulting in work repeatedly grinding to a halt. Analysis of data recorded on-site by Septentrio’s engineers was able to place the blame firmly at the door of the sun. The year was 2012 and the sun was reaching the peak of its 11-year activity cycle and, with this came increasingly frequent and intense disturbances to the upper layers of the Earth’s atmosphere. It was these disturbances that were ultimately found to be responsible for the behaviour of the GNSS receiver. Scintillation events are most frequent and intense in the regions around the magnetic equator and also, but to a lesser extent, at the poles. Similar to other natural phenomena, their appearance is unpredictable with scintillation events having been reported in the mid-latitude regions of Western Europe and the United States. 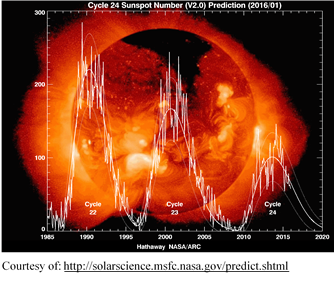 measured by the number of sunspots, follows a well-documented 11-year cycle. The peaks in solar activity are characterised by frequent solar flares releasing powerful bursts of high-energy protons and X-rays. 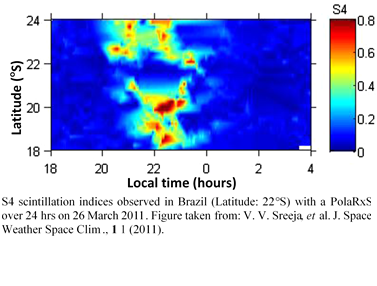 These particles then interact with the Earth’s atmosphere contributing to an increase in scintillation events in the years close to solar activity peaks.Scintillation events also show variation over the course of the day with sunset triggering a sharp increase in ionospheric activity that can last for several hours. 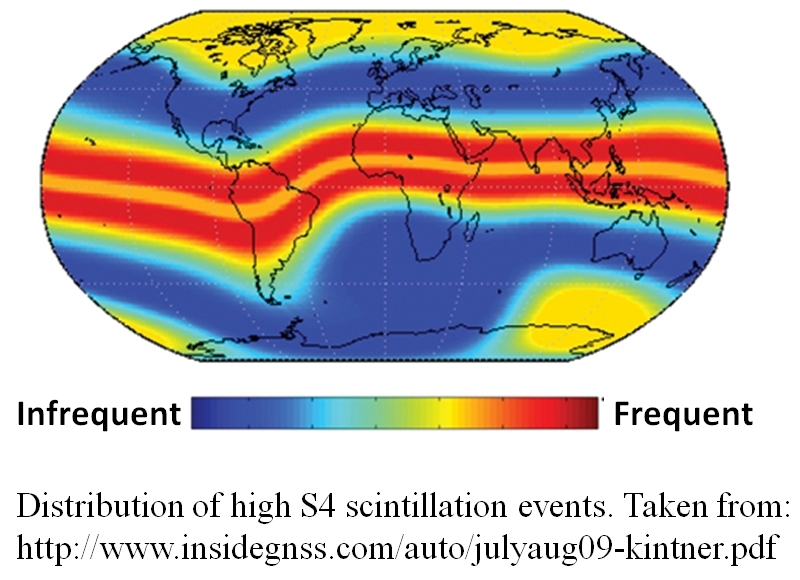 Scintillation events also show variation over the course of the day with sunset triggering a sharp increase in ionospheric activity that can last for several hours. What does scintillation mean for GNSS positioning? GPS or more generally, GNSS (Global Navigation Satellite System) receivers use the signals from satellites orbiting the earth to calculate their locations. 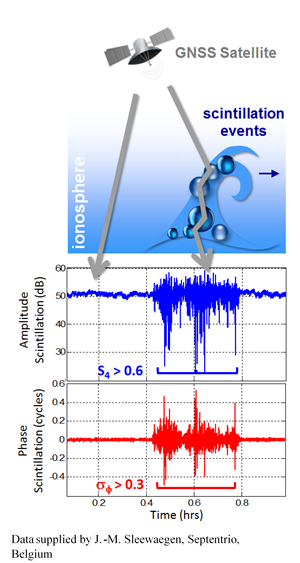 An increase in solar activity can produce so-called scintillation events in the ionosphere which can degrade the quality of satellite signals. In standard GNSS receivers, mild scintillation can degrade position accuracy by up to several meters. 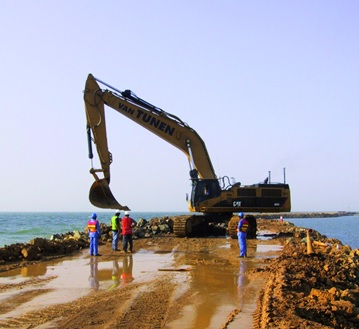 More severe scintillation can cause cycle slips or, in the most extreme cases, total loss of signal lock. During these times, even normal radio communication can be severely disturbed by scintillation. So, whether you are doing precision agriculture in Brazil, oil exploration in Alaska or running a large construction project in Singapore, you had better make sure your precsion GNSS system comes with ionospheric robustness built in. involvement in various projects in Brazil, a country typically plagued by scintillation, Septentrio has developed IONO+ technology. Equipped with IONO+, Septentrio receivers can continue to track signals in conditions that would frustrate standard receivers. It also enables Septentrio receivers to recognise scintillation events and limit any adverse effect they might have on position accuracy. 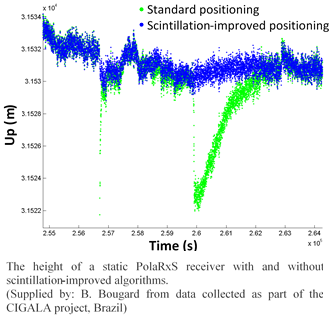 The plot opposite shows the height calculated by a static receiver during a scintillation event: the IONO+ algorithms correctly identify and remove signals affected by scintillation from the position calculation.